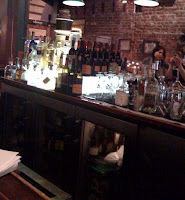 With brick walls and long rounded counter leading to the kitchen, Cha Cha Cha has an excellent canteen layout with plenty of swivel stools and a few TVs to keep its patrons occupied while they wait at the bar. Dining tables line the restaurant’s walls with a separate dining room found at the rear of the building packing in locals and visitors searching for a good meal. Old black and white photographs adorn the walls adding to the festive vibe inside Cha Cha Cha. While the bar caters to couples - in for a drink - and singles - waiting on their friends - the restaurant is an excellent choice for large groups looking to enjoy a couple jugs of sangria while sharing a wide selection of tapas for dining. Its back room was crowded as were the many booths with diners spilling into the aisles making the narrow passageway tight. As I sipped on a Pacifico and watched the guy next to me constantly check his phone and turn his head towards the door obviously waiting on his date, it occurred to me why I wasn’t a big fan of tapas restaurants. It was because of the “Tapas Effect”. In the past, Cha Cha Cha had always been one of those places where I’ve gone in a group for a birthday celebration or to get the group of friends together to catch up which always leads to... the Tapas Effect. The Tapas Effect is the struggle of navigating a hostile shared-food dining experience. Parceling out a jug of sangria or a pitcher of margaritas is no big deal but when you’re a vegetarian or just a picky eater then ordering tapas becomes a stressful endeavor. First, you have to balance everyone’s desired choices while strategizing on the items you can actually consume on the menu. What dish will be served first and how to get to it before someone else does. Do you double order, take your chances or just make an obvious play for the desired food early in the process? There are too many variables to deal with especially in a larger group. I’ve learned that the best plan of attack in this situation is to sit closest to the aisle where the waiter will deliver the food. You get first dibs on all items as they’re passed to your neighbors. Now if you’re stuck in the middle, the key is to use distraction by playing the role of conscientious host handing a jug of sangria or pitcher of margaritas (a bottle of wine also works well) to occupy the hands of the intended recipient of the coveted dish so the waiter is forced to place the platter closer to you or one spot ahead in the rotation. Once the food starts making its way around the table – typically two to three tapas plates are delivered at once- pass the undesired items quickly while doubling up when appropriate on items that you can actually eat or want. The drunker your friends the better your odds at them not getting wise to your game plan. Finally, the bill… how do you deal with the back and forth on amount owed, the friend that never pays enough and the fact that you’ve eaten about a quarter of what everyone else had. Do you split it evenly with the group even though you chose not to eat half the dishes or just try making up for it by drinking your way to an even split? Drinking your way to an even split – an aggressive yet effective way to go - can be dicey because it can lead to being very drunk in an uncomfortably confining space, usually in a booth or the middle seat at the table, creating havoc on everyone around you as you struggle to sit in one place or become obnoxious. Your best bet here is to grab the bill and do the math for the table. You have to be careful that you planned ahead for this move and didn't drink so much that your amount too far off the mark. Over estimate the split and you'll be called out for trying to pull fast one on everyone and underestimate and you'll be paying the remaining part of the bill. Worst case scenario is being called out by someone and your response should be to plead drunkenness and simply forgetting to carry the 3. Nobody will question you and there’s a chance you get out of there paying the appropriate amount. Be wary of the light drinker, engineer or accountant at the table because they're always called on to work out the bill. Those are the times when you’re drinking your way to tapas equality. 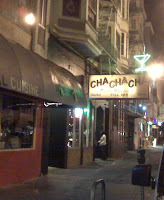 Cha Cha Cha, (Original McCarthy’s) found between 19th & 20th Streets on Mission is a popular place for just about anyone on a night out not looking to venture far from their comfort zone, looking for decent food, plenty of alcohol and a good time. So the next time you’re asked about celebrating someone’s birthday offer up Cha Cha Cha but remember to choose your seat and company wisely or else you will be dealing with the Tapas Effect.